My new favorite Instagram account has to be DallasPetsAlive and their Mutt Bombing Project. This is by far one of the best marketing/Instagram campaigns I have seen from a shelter, let alone any organization. Mutt Bombing is similar to photo bombing. It happens when someone (in the case a dog) gets into your photo without you realizing it. They post mutt bombed images on their website, Facebook, Twitter and Instagram with an adoptable dog added to the photo. They tag the original poster on Instagram and add comedic captions to show them what happened to their photo. Genius! On the Mutt Bombing website, each photo has a link to Dallas Pets Alive where you can adopt the mutt in the mutt bomb. If the mutt is still available, you’ll get a direct link to that dog. If the dog found his/her forever home, you’ll get a link to their over animal listings. I couldn’t be more impressed with this campaign, especially because it has a meaningful cause. Kudos to you Dallas Pets Alive and your Mutt Bombing Project. I also gotta show some love for their Mutt Bomb Machine, which helps them with all their Mutt Bombing. It’s a tough gig, but someone has to do it. Also, more kudos to them for being exited about this blog post. 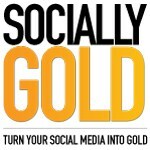 @Socially_Gold Wow that's mighty awesome of you. If we had hands we would totally give you a high five.